Ms. Olamiju participated in SMDEP at Yale School of Medicine in 2012. She graduated from Columbia University in 2015 with a bachelor’s degree in Race & Ethnicity Studies with a focus on health disparities. 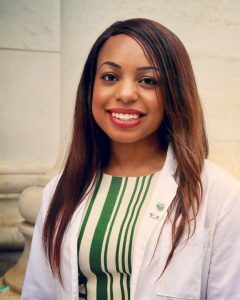 Today, Ms. Olamiju is a medical student at Yale School of Medicine in the class of 2021. How did SMDEP influence you? I would best describe the six weeks I spent at Yale School of Medicine as an SMDEP scholar as transformative, inspiring, and affirming. As the first in my family to pursue a career in medicine, my SMDEP experience allowed me to gain confidence in my ability to make a fundamental impact in the field of medicine as a woman of color. I was encouraged by medical students, physicians, and faculty members who showed great interest in my personal ambitions and encouraged me to reach my full potential. Moreover, SMDEP taught me the importance of working in partnership with peers in order to thrive academically. Some of my most vivid and positive memories of SMDEP involve studying with other students to complete challenging problem sets or assignments. While the work was certainly rigorous, we found solace in each other’s company and our shared experiences. The field of medicine is very collaborative in today’s age. As future physicians, we will soon be working in multi-disciplinary teams to coordinate quality care for our patients. SMDEP excels at encouraging strong collaborations with colleagues at an early stage. After completing SMDEP, upon return to my home college of Columbia University, I was energized by this collaborative spirit and merged it into my extracurricular pursuits. I became President of the Minority Association of Premedical Students (M.A.P.S) on campus for the next two years and collaborated to plan events that benefited both our student population and residents of our local Harlem community. I also became co-founder of a residential dorm on campus for pre-medical students that fostered peer-to-peer support. I am very grateful to my mentors whom I met during SMDEP for their unwavering support, and I vow to always embody the spirit and mission of the program as I embark into my future career.